Figure 1: The light curve of Proxima Centauri as seen by the Evryscope around the time of the superflare. Three weaker (but still strong) flares were detected in the aftermath of the superflare, marked by arrows. Figure 1 in the paper. To discover this superflare the paper authors used data from the Evryscope, which we’ve covered in this Astrobite. Despite the name it’s not actually a single giant telescope formed out of every telescope on Earth (sadly), but is instead a unique collection of twenty-seven small telescopes all mounted on a single German Equatorial mount in Chile, one of its goals being to catch and record these short-duration transient events. It pans across the sky throughout the night taking images of 8,000 square degrees of the southern night sky simultaneously every two minutes, all night long. On March 18, 2016, at 8:32:10 UT the Everyscope detected a superflare that lasted for over an hour, though the bulk of the energy was emitted in the first ten minutes. The authors estimate that the total energy radiated at all wavelengths was 1033.5 ergs, ten times more than any previously-seen flare. However, based on the many other, less powerful flares observed by the Evryscope, the authors estimate that flares with an energy release of 1033 or more ergs probably occur about 5.2+0.2−3.0 times per year. The authors also investigated the effects of so many flares on a hypothetical atmosphere of Proxima Centauri b by running a 1D atmospheric simulation where it’s assumed to have an Earth-like atmosphere. Strong proton fluxes from coronal mass ejections associated with flares can destroy ozone by first breaking nitrogen (N2) apart into nitrogen atoms which react with oxygen (O2) to form NO and O. The NO then reacts with ozone in a catalytic reaction to form NO2, depleting the ozone (O3) layer in a very efficient manner. The simulation generated a series of flares with a range of energies compatible with what has been observed in the past, which interacted with the model atmosphere over a simulated five-year period. Each flare had an 8% chance to have a strong proton flux associated with it (based on other work). Even this low chance of producing strong proton fluxes, however, depleted the ozone layer by 90% within five years (as shown in Figure 2). Thus it seems highly probable that Proxima Centauri b has no ozone layer to speak of. 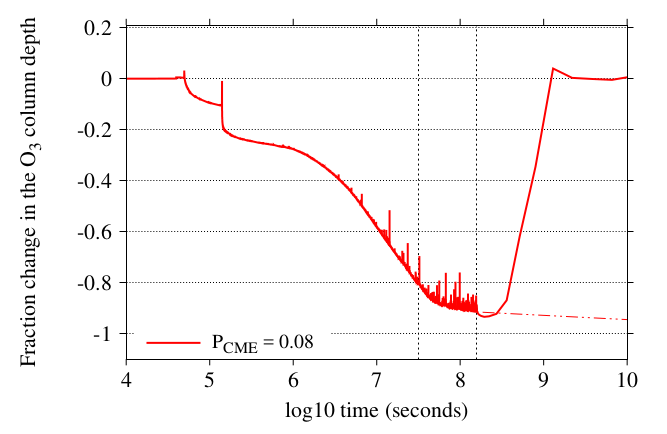 Figure 2: The depth of the ozone column in the simulation performed in the paper. The two dashed lines denote one year and five years after starting the simulation. 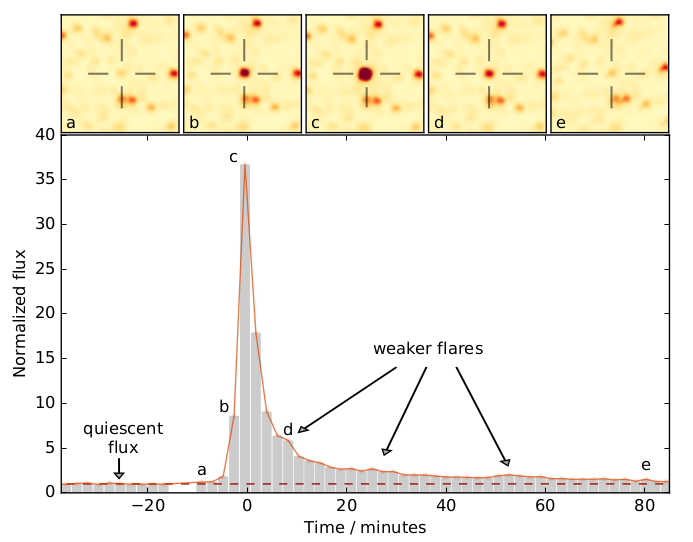 Flares were stopped after five years in the simulation which leads the solid line to recover back up to full, but the authors note that the dashed line is more likely in reality where flares continue. Figure 5 in the paper. The amount of ultraviolet light reaching the surface in the absence of any ozone in the atmosphere spells bad news for any living thing unlucky enough to be in its path. The superflare over its duration would have deposited an estimated 3.6 J/cm2 of the most dangerous UV-C light to Proxima Centauri b, which is some 65 times greater than the amount needed to kill off the most radiation resistant organism known, the bacterium Deinococcus radiodurans. Proxima Centauri is a very active star, and with the Evryscope up and running we’re in a good position to catch the next superflare it gives off (along with any regular flares). And if you were planning a beachside vacation to Proxima Centauri b, you may want to hold off until you find a sunscreen with an SPF of a million or so.